The earliest way to explore the Hunter was by water. The Aboriginal people used canoes to travel and for fishing. When the first Europeans came to the region, they sailed in on large ships to explore the area. Later, steamers were used for travel between Sydney, Newcastle and Morpeth and allowed for trade in timber, coal and lime. Eventually the popularity and cost-effectiveness of railways cause river transport in the Hunter Valley to be obsolete. 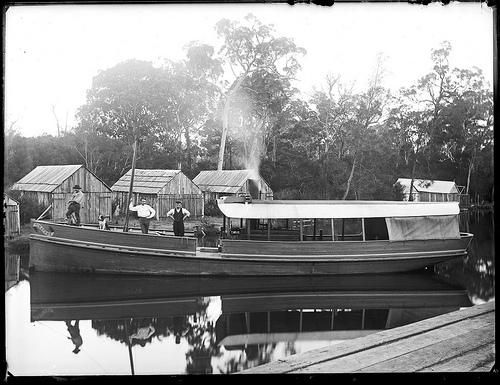 'SS Pinafore' at Cockle Creek by Ralph Snowball, NSW, [n.d.]. Part of the UoN Norm Barney collection. The Newcastle Harbour has remained relevant and has been molded over the years to assist export, including the building of the breakwater. Today, Newcastle continues to be one of the largest coal ports in the world.